SALGUEIRO, Brazil, Oct 21 2011 (IPS) - The visual impact is harsh: flattened hills, valleys full of mud, and kilometres and kilometres of bulldozed land – the modification of nature in Brazil’s semiarid Northeast region is disturbing due to the enormous dimensions involved. 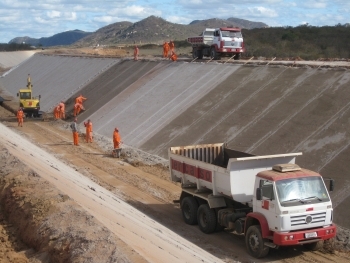 It will take a total of 713 km of canals, aqueducts, dams, tunnels and pumping stations to divert a small portion of the waters of the São Francisco River, which emerges in central Brazil and runs through part of the northeast before emptying into the Atlantic. The redirected water flow will supply rivers that dry out during the long dry season in the extreme Northeast, an area known as the “drought polygon”. The megaproject is a complex undertaking because the canals must slope precisely 10 cm per km as they cross a rolling landscape, so the water will run slowly. Taming the topography will require the construction of 42 aqueducts across valleys and five tunnels through mountains. And nine energy-guzzling pumping stations will be built to pump the water 300 metres uphill along the eastern branch of the project and 170 metres uphill along the northern branch. The cost of the project has already climbed to 3.9 billion dollars, the Ministry of National Integration admitted in August. The São Francisco River, once known as the "river of national unity" because it joins the centre of the country with the Northeast, became an apple of discord after tragic droughts, especially in 1993, revived the idea of diverting water from the river as an alternative solution to the chronic shortages in the Northeast. The idea, which first emerged in the 19th century, finally began to be implemented by the administration of former president Lula, who came from a poor family from the Northeast that moved to São Paulo, fleeing the poverty caused in large part by droughts. The highest-profile opponent of the project is Luiz Cappio, the Catholic bishop of a small town on the banks of the São Francisco, who held hunger strikes in 2005 and 2007 demanding that work on the project be called off. The total investment will be significantly higher than originally projected. Work on some stretches has ground to a halt, and there are contracts to be revised and additional services to be hired. The entire undertaking is far behind schedule. The work began in 2007, when the plan was for then president Luiz Inácio Lula da Silva (2003-2011) to inaugurate the project in 2010. But it looks unlikely to even be finished before the term of his successor, President Dilma Rousseff, ends in 2014. “There is no reason to worry about the fees that consumers will be charged for water, which will be adapted to the local reality,” said José Luiz de Souza, coordinator of support for development projects in the Ministry of National Integration. The population that will benefit from the water supply is among the poorest in Brazil. But the fees will take into account operating and maintenance costs, to guarantee that the project is “financially sustainable,” said Souza. However, there is no talk about recouping the investment. The São Francisco River Integration Project will ensure the supply of good quality water to 12 million people in 390 municipalities in the states of Ceará, Rio Grande do Norte, Paraíba and Pernambuco, according to the government. The megaproject is expensive, but it is justified in an area with such severe water shortages, says economist Tania Bacelar, a professor at the Federal University of Pernambuco who is an expert on development in the Northeast. The average amount of water available annually in the northernmost part of the Northeast is 450 cubic metres per capita – one-third of the minimum recommended by the United Nations, according to the Ministry of National Integration. The integration of river basins will generate synergy – in other words, the combined effect will be greater than the sum of the individual parts of the project, because it will improve water management overall. Guaranteed supplies in the dry months will make it possible to store less water in the reservoirs and to use it instead to help fuel economic development, while reducing water loss by evaporation, the authorities say. However, the project has many critics, despite the arguments in its favour, including calls for solidarity with the Northeast, whose nine states are home to 28 percent of the population of 192 million people, but whose river basins have only three percent of the country’s surface water. The volume of water in the São Francisco, the longest river that runs entirely in Brazilian territory, has already been affected by pollution and sedimentation, as well as deforestation along the riverbanks. Suassuna argues that this makes the redirection of water from the river, which is already used for a number of purposes, unsustainable. The dams built along the river generate 95 percent of the electricity in the Northeast, and the waters supply expanding irrigation projects, he said. In 2001, drought severely reduced the volume of water in the river, limiting the energy it generates, he pointed out. That is why the priority should be the revitalisation of the river basin, an effort that has fallen short up to now, said Suassuna, a researcher at the Joaquim Tabuco Foundation, an Education Ministry body based in Recife, the capital of the state of Pernambuco. The criticism is countered by the Rousseff administration, which notes that only 1.4 percent of the water in the São Francisco River – or 26 cubic metres per second – will be diverted. The volume of water to be redirected will only be higher than that when there is a surplus in the reservoirs, Suassuna said. Historically, there has only been a surplus of water on rare occasions in Sobradinho, the largest reservoir along the river, the activist pointed out. He added that for 60 percent of its length, the São Francisco runs through the semiarid backlands of the Northeast, where its tributaries have intermittent flows, which limits the volume of water in the main river and the reservoirs. “For 16 years I have been warning about the risks of the diversion of the water, but now I’m talking about the consequences,” said Suassuna, who has written dozens of articles, many of which have been compiled in a book, criticising the megaproject. The construction of the canals and dams, which destroys vegetation, has further aggravated desertification in Cabrobó, the municipality where the northern branch of the project begins, said the activist. Moreover, the canals will interrupt the paths of migrating animals, leading to increasing inbreeding, he said. In addition, he warned, the project will generate biological imbalances in local rivers, as different fish species, especially predator fish, are pumped in from the São Francisco River. Suassuna said there are cheaper and more effective alternatives. A study by the national water regulatory agency, ANA, suggested better use of the water resources that already exist in the semiarid Northeast, such as groundwater and 70,000 ponds. Another initiative, which benefits the rural population, the most vulnerable to drought, is rainwater collection and storage in tanks, for human consumption as well as irrigation for community-level small-scale farming. The Articulação no Semi-Árido Brasileiro (ASA), a network of nearly 1,000 NGOs, labour unions and community and religious institutions focused on Brazil’s semiarid region, has already helped local residents build 350,000 household water tanks and 9,000 irrigation tanks. Large-scale irrigation, which will be bolstered by the diversion of part of the water from the São Francisco River, “is not sustainable because it leads to salinisation of the soil, due to the increase in evapotranspiration (the sum of evaporation and plant transpiration),” said Jean Carlos Medeiros, coordinator of the rainwater programme, whose goal is to distribute one million water tanks. The salinisation has already affected the melon crop in Rio Grande do Norte, he pointed out. ASA’s programmes do not compete with the river diversion project, which would mainly provide water supplies to the urban population. But it does fight for government funds and for priority treatment in public policies. It will only be possible to gauge the effects of the megaproject, and compare them to the achievements of the rainwater harvesting initiative, once the former is up and running. But that will take years, as the work on the São Francisco River project is moving ahead so slowly that some sceptics even say it may never be completed.